Mast Joku: NAVRATRIWISHES- Wish you and your family a very Happy Navratri. NAVRATRIWISHES- Wish you and your family a very Happy Navratri. Mubarak ho aapko NAVRATRI ka Tyohar. Sada khush rahe aap aur apka Parivar. Time for celebrations - you're home or abroad. Let's worship Goddess Durga and the prayers be done. Wish you a very Happy and Blessed Naaratri! Goddess Durga is an embodiment of Shakti who overcame the evils of the world. May this Navratri, everyone uses Her blessings and power to overcome their problems in life. Wish you a very happy Navratri! 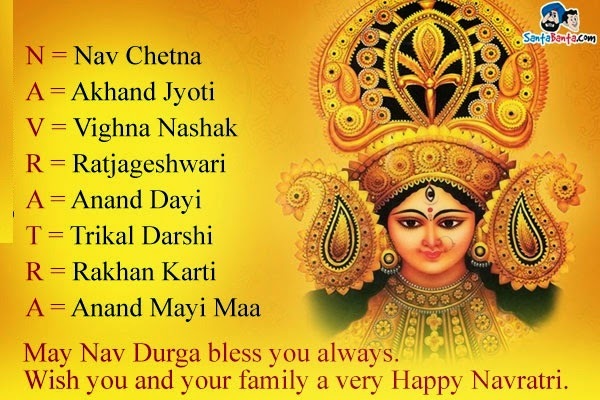 May these nine manifestations of Shakti known as 'Nava-Durga' bless you at all times! May you experience blissful worshipping on Navratri!